Many Mac OS X hints involve quick trips into System Preferences. The app, built into the operating system, gathers together all sorts of systemwide options—which is why it can get a bit cluttered. An anonymous Hints reader shared a great tip for cleaning up System Preferences by hiding those icons that you need to access less often. This technique was introduced with Lion, but we realized we hadn't yet written it up. In the System Preferences app (launched from the Dock or from the Applications folder), go the View menu and select Customize. Or, alternatively, click and hold on the Show All button in the System Preferences header, and then choose Customize at the very bottom of the pop-up menu. 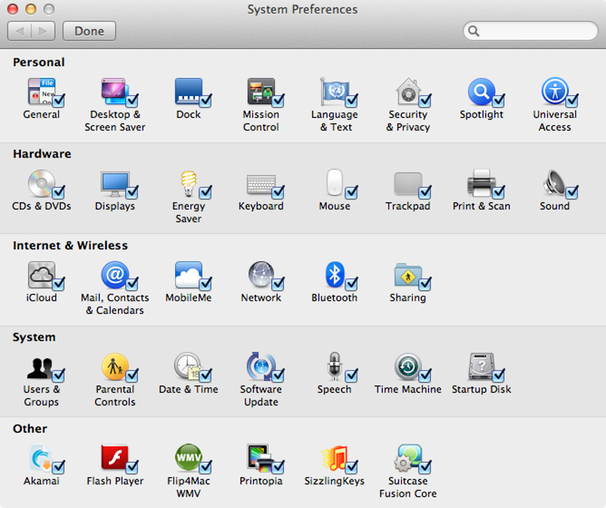 In either case, you'll see all of your available Systems Preferences icons, with a checkbox next to each one. If there are preferences you never need, uncheck them. On my Mac, for example, I know I don’t need MobileMe (since I don’t use it) or Parental Controls (since I don’t use them, either). Once you’ve unchecked the preferences you no longer need, click the Done button in the header (or deselect Customize from the View menu). That’s all there is to it—the preferences you uncheck have vanished. But what if you suddenly need one of those hidden preference panels? No worries: Even hidden preferences appear in both the View menu and the Show All menu that appears when you click and hold on that button. To unhide a preference more permanently, go back into Customize mode, at which point hidden preferences reappear. Then, check their boxes before clicking Done.